Original recording by JIMMY MARTIN, lead vcl, g; BOB OSBORNE, mdln, high baritone vcl; ROLAND "SONNY" OSBORNE, bjo, tenor vcl; HOWARD S. WATTS ("CEDRIC RAINWATER"), b; MERLE F. TAYLOR ("RED TAYLOR"), fiddle on Nov 16, 1954 at RCA Victor Studio, Methodist Television Radio & Film Commission, 1525 McGavock Street, Nashville, TN. Producer: Stephen H. Sholes. Re-recorded on 22 Apr 1964 at Columbia Recording Studio, 804 16th Avenue South, Nashville, TN, by JIMMY MARTIN, lead vcl, g; THOMAS GRADY MARTIN, lead g; MEREDITH E. MILLER ("MIKE MILLER") , bjo, baritone vcl; VERNON DERRICK, mdln, tenor vcl; ROY M. HUSKEY JR. ("JUNIOR HUSKEY"), b; MURREY M. HARMAN JR. ("BUDDY HARMAN"), dms; HELEN "PENNY JAY" MORGAN, harmony vcl. 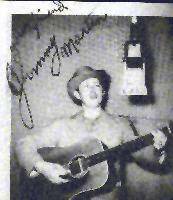 Recording data were taken from the booklet accompanying Bear Family Records' 5-CD set "Jimmy Martin and The Sunny Mountain Boys" (1954-1974). transcribed from the Nov 16, 1954 recording by Manfred Helfert. I went to the doctor, he says I'm alright. I know he's lyin', I'm losing my sight. 20/20 vision and walkin' 'round blind. Since she's gone and left me I feel so alone. I carry a heart that is heavy as stone. With my eyes wide open I lay in my bed. If it wasn't for dyin' I wish I was dead. You just couldn't know her the way that I do. You say that she's wicked, and maybe it's true. I've lost her, I've lost her, oh what will I do? I bet you're not happy if she's there with you.